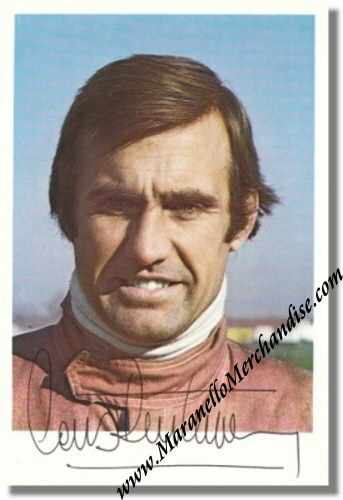 This official Ferrari factory issued postcard of F1 ace Carlos Reutemann has been signed by "The Drake", Enzo Ferrari, himself on January 27, 1977. 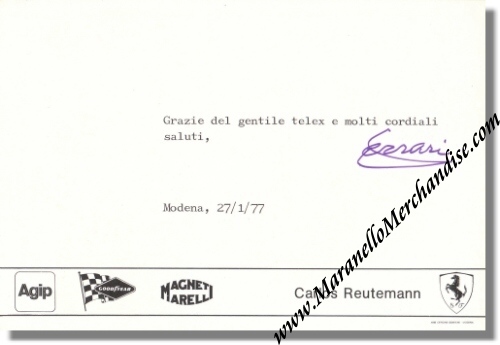 The typed text on the back refers to the kind telex that Enzo received and send his regards. The Reutemann signature on the front is printed. Only 1 available of course as every autographed item is unique and we provide a Certificate of Authenticity with it which guarantees that this is a genuine Enzo Ferrari signature.